The pope canonized them, but these three children didn't actually predict anything in 1917. Today we're going to go back in time nearly a century, to the day of one of the Roman Catholic Church's greatest miracles; indeed, an event cited by some religious scholars as not merely our greatest miracle, but perhaps the most important event in history. This was the incident known as the "Miracle of the Sun", an inexplicable solar phenomenon predicted by three children to the day, and witnessed by tens of thousands of gathered worshipers and journalists. How can one be skeptical of something with so many eyewitnesses, so much printed news coverage, so many photographs, and such a specific prediction? Three shepherd children, ten-year-old Lucia Santos and her two cousins, worked in a field called Cova da Iria near Fátima, Portugal, in 1917, during the first World War. Over a period of six months, the children reported a long series of religious apparitions, the most extraordinary of which were six visits from the Virgin Mary herself. Mary told the children many things, including three famous secrets; but the most extraordinary revelation was that on October 13 of that year, they would witness a miracle. The children's reports of these apparitions in the village church attracted the attention of a local newspaper or two, which in turn attracted the attention of a regional newspaper or two; and soon the Cova da Iria fields turned into something of a Grand Central Station of miracle seekers. And, on October 13, as many as 100,000 believers packed the area, and just as the Virgin Mary foretold, they witnessed an inexplicable miracle in the sky: From behind the rain clouds, the sun came out, danced, changed colors, spun like a pinwheel, and made a most sensational demonstration. Photographs and articles plastered the newspapers of the world, and thirteen years to the day later, it was officially recognized as a miracle by the Roman Catholic Church. It's hard to argue with the facts of this event. The day was predicted in newspapers by a ten-year-old girl, and this is thoroughly proven. Tens of thousands of people personally witnessed exactly what the prediction said would happen. The sun's behavior was clearly unique, and couldn't have been mistaken for some chance atmospheric oddity. You add all this together, and the only reasonable conclusion is that Lucia Santos' vision and prediction was a genuine miracle. Unless, of course, you set a reasonable standard for evidence, and start looking for things like alternate explanations. Let's point our skeptical eye at some of these details one by one, and see if they hold up to scrutiny. I'll start with the children's reports of six months of religious apparitions. These were three kids, ages 7 to 10, and came back home each night with wild tales. Is this surprising? Is the miraculous appearance of the Virgin Mary really the most probable explanation for stories told by small kids? The two youngest, Lucia's cousins, both died of influenza within a couple of years, but Lucia lived to the age of 97 and clung to her stories her entire life. Investigator Joe Nickell reports that Lucia's own mother said that she was "Nothing but a fake who is leading half the world astray." Friar Mario de Oliveira, who knew her well, described her as living in a "delirious world of infantile fantasies" and suffering from "religious hallucinations". There are alternate explanations for the children's stories, imagination and boredom being chief among them. So onto the specific date of October 13, 1917, so widely publicized in print that tens of thousands of people appeared. Clearly you're not going to make a pilgrimage like that unless you're pretty religious and pretty confident that you're going to witness a miracle. So, we have a crowd preconditioned to expect to see something. Newspaper accounts estimated between 30,000 and 100,000 worshipers gathered at Cova da Iria. However, a number of photographs of the crowd do exist, and though it does look like several thousand to me, I certainly wouldn't go as high as thirty. Either the photographers chose not to show the largest part of the crowds, which seems an odd choice; or the newspapers reported exaggerated numbers. Interestingly, if you do a Google image search you'll find lots of pictures of huge crowds, many of which show a perfectly bright and sunny day. It is always reported to have been raining quite heavily during the event, and I only ever found a single picture that showed a crowd with umbrellas. So I think a snippet of skepticism is warranted when viewing these large crowd photos with thousands of faces staring heavenward. How impressive was the sun's display? An old black and white photograph of the actual sun miracle event shows a lot of dark rain clouds behind some trees and the sun poking through. There is certainly nothing in the photograph that looks unusual, but of course a photograph is static. Whatever the crowd saw was not interesting enough to be noticeable in a photograph. A lot of skeptical explanations have been put forward: Dust in the atmosphere causing the sun to appear in different colors, a sundog or parhelion formed by ice crystals, a rainbow, and observations that the descriptions don't match where the sun should have been in the sky at that time. It's also been pointed out that observatories around the world reported nothing unusual that day, so whatever it was had to have been a localized phenomenon. Personally I gravitate toward an even simpler explanation, fueled by having spent many happy hours as a child lying on my back and staring directly at the sun. When you do that, you can't see a round, static disk. Your eyes and pupils spazz out, and "dancing" is certainly one way to describe what you see. Spinning would be another valid way to perceive it. If there are tens of thousands of people fully expecting to see something amazing, and someone shouts "Hey look at the sun," guess what, you've now got tens of thousands of people seeing something amazing in the sun. There's an experiment you can do. Stand on the sidewalk and point up toward the top of a building. People walking by will look up too. Some of them will pause. If another person looks at them, they might point up as well. Anything anyone sees will be assumed to be what you were pointing at. Go to Starbucks, have a coffee, and watch the fun. To me it's not only plausible, it's probable that if a single person at Cova da Iria told that desperate crowd that the sun looked strange, you'd have had ten thousand people agreeing "Yeah, it did look a little funky, kind of jumped around and danced when I tried to look at it," or whatever they thought they saw. And this would have happened on October 12, June 1, or any other day you choose. Most of what's popularly reported about the sun incident, such as the colors and the spinning, comes from Father John de Marchi, a Catholic priest who spent years interviewing eyewitnesses to build evidence supporting the miraculous event. But more objective assessments of the eyewitness accounts have found very little evidence of a single shared experience. Author Kevin McClure, who also compiled eyewitness accounts, reported that he had "never seen such a collection of contradictory accounts in any of the research I have done in the past 10 years." If you were there, as a devout Catholic (otherwise you wouldn't be there), you fully believed in a miracle happening that day (otherwise you wouldn't be there), whether you personally saw anything or not you'd support the majority opinion, and probably go to your grave insisting that a miracle happened there. There's no surprise that Father de Marchi was able to form a consensus description of a spinning color wheel of a sun, and no need for any actual event to justify his consensus. Father de Marchi says the sun was a spinning color wheel that day, which cannot be reconciled with the photograph. I say there was nothing special in the sky that day, which reconciles exactly with the photograph. Now let's go back to those three secrets that the Virgin Mary supposedly revealed to Lucia. 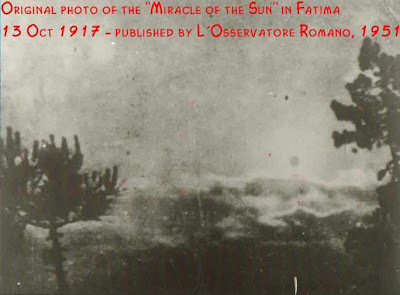 The "miracle of the sun" was not one of the three secrets, in fact Lucia wouldn't tell anyone what the secrets were until many years later, when she was a nun, and was asked to write them down by the Bishop of Leiria in 1941. She would only write the first two. The first secret was a vision of Hell, not really a prediction about anything, nor much of a secret. The second secret was a prediction that World War I would end, and that World War II would start if God continued to be offended by man's crimes. This wasn't terribly surprising either, since World War II had already begun when she wrote it. Not the kind of prediction that blows my mind. It took two more years before the Bishop of Leiria finally got Lucia to write down the third secret, and when she did, she sealed it in an envelope marked "Do not open until 1960", because she felt that nobody would understand it until then. When the Vatican revealed its contents in 1990, Cardinal Ratzinger (now Pope Benedict XVI) warned that it was anticlimactic, saying "No great mystery is revealed; nor is the future unveiled," and even speculated that Lucia's vision may have simply been conjured from religious texts. It described a vision full of religious imagery: Angels with swords, masses of corpses on a mountainside, Bishops and Priests being killed by soldiers, souls ascending to heaven. The takeaway from Lucia's three secrets is that in no way were they miraculous or otherwise unexplainable predictions. The Roman Catholic Church will only declare a miracle after all other possible explanations have been ruled out, leaving divine intervention as the only possible rationalization. Since the Fátima "Miracle of the Sun" is easily explained, and even falsified by photographic evidence, it's probably time for the Catholics to reexamine their criteria. Dawkins, R. Unweaving the Rainbow: Science, Delusion and the Appetite for Wonder. Boston: Houghton Mifflin, 1998. 133-135.
de Marchi, Joao. The True Story of Fatima. Saint Paul: Catechetical Guild Educational Society, 1956. McClure, Kevin. The Evidence for Visions of the Virgin Mary. New York: Sterling Publishing, 1983. 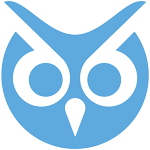 Meesen, A. "Apparitions and Miracles of the Sun." International Forum in Porto “Science, Religion and Conscience”. 23 Oct. 1005, 1645-6564: 199-222. Nickell, Joe. Looking for a Miracle: Weeping Icons, Relics, Stigmata, Visions, and Healing Cures. Amherst: Prometheus Books, 1993. 176-181.